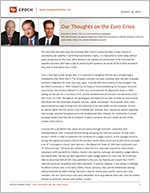 Our Thoughts on the Euro Crisis - Epoch Investment Partners, Inc.
For more than two years now, the sovereign debt crisis in Europe has been a major source of uncertainty and volatility in world financial markets. Clearly, it is impossible to invest today without some perspective on this issue. What follows is our analysis and assessment of the crisis and the possible outcomes. We’ll take a stab at answering the questions we would all like to have answered: How does it end? When does it end? First, a look back at how we got here. It is important to recognize that this story actually begins immediately after World War II. The European continent has been traveling down the path of greater economic integration for more than sixty years. It started with the formation of the European Coal and Steel Community in 1950, followed by the Treaty of Rome establishing the European Economic Community (“the Common Market”) in 1957, and continued with the Maastricht Treaty in 1992 setting out the plan for a monetary union, and the establishment of Economic and Monetary Union (the “euro”) in 1999. Throughout, the guiding goal and objective has been to foster an environment that allows the free movement of goods, services, capital, and people. The European Union really was conceived as a way to bring to an end centuries of war and conflict on the Continent. To form an opinion about how the current crisis is handled and resolved, then, requires an opinion regarding how strongly attached Europeans are to this fundamental idea. Likewise, the statements of current European leaders that they will do whatever it takes to preserve the euro should be seen in the context of this history. The real catalyst for the crisis was the revision in February 2010, by newly-elected Greek President George Papandreou, of the 2009 budget deficit for Greece: from 5% of GDP to 12.7% of GDP. Greece, it turned out, was fiscally a mess, and now the world knew just how over-extended they were. The immediate result was a crisis of confidence, a dramatic widening of the spread between Greek bonds and benchmark German bunds, an inability for Greece to access capital markets, and an IMF-led bailout in May of 2010. It’s been downhill ever since, with bailouts for Portugal and Ireland following Greece, a full-blown debt restructuring for Greece in early 2012, euro-wide recession, austerity, and political upheaval. The “United States of Europe.” This is the best-of-all-possible-worlds outcome and the least likely to happen, we would argue. In this utopian vision for Europe, all parochial differences are set aside to advance the primary goal of achieving full fiscal union to match the monetary union begun in 1999. European leaders agree that the euro is irreversible, and that a break-up is inconceivable. The euro zone nations agree to cede fiscal autonomy to Brussels. Treaties are amended to provide for a banking union, euro zone-wide deposit insurance, the issuance of eurobonds representing joint and several liability by all members, plus a euro zone treasury assessing taxes on euro zone members. Euro breakup. This is the “Atlas Shrugged” scenario where Germany and other northern tier euro members finally decide that enough is enough, that the common currency was a mistake from the beginning, and that it no longer makes economic sense to participate in a one-sided “union” that necessitates a continuing and open-ended transfer of wealth from North to South. While not the most likely scenario, we cannot rule out the possibility that the grand experiment fails. To elaborate further, scenario two is possible but not the most likely because it requires an objective and dispassionate cost-benefit analysis. That is, euro members will support the euro only if the economic benefits justify the costs, and as soon as the scales tip to the cost side, support will evaporate. The problem with this scenario is that it ignores an emotional commitment to European unification. It ignores sixty years of history (and all the European history before WWII). Scenario three is most likely, we would argue, because of the historical forces outlined earlier as well as the growing realization that there really is no going back. Even if Germany and the Netherlands and Luxembourg wish they could go back in time and elect to remain out of the euro, they realize (or, are coming to the realization) that it’s too late now. The costs associated with a breakup are too great. If Germany “shrugged” like the Atlas in Ayn Rand’s novel, the collapse of peripheral economies would devastate the German economy. While there are those in Germany who seem to think they can turn their backs, batten down the hatches, and let fortress Germany ride out the storm, there is no way to stand aside and let the rest of Europe fall since there is no safe place to stand. The gravitational pull from the collapsing periphery would drag down the center as well. A possible timeline, then: Germany ratifies the ESM in September following a favorable ruling by the Constitutional Court currently evaluating the ESM’s constitutionality (admittedly a wild card since there is really no way to predict how a judge will rule). The ESM is then funded, Spain files a formal application and signs the required MoU committing to specified reforms. (Having already asked for and received a €100 billion bank bailout, Spanish resistance to such a step will be muted. Besides, they will only be agreeing to do what they have already agreed to do). The ECB, as outlined by Draghi, can then enter the market, buying short-term Spanish bonds. The combination of ESM funds and ECB buying relieves concerns about Spain, and Italy as well by extension. The ability of Spain and Italy to continue to tap markets to meet refinancing needs is assured, as is their commitment to fundamental economic reforms. Having bought time, work begins and progresses on the establishment of a banking union. At the same time, creative and nuanced ideas for a common eurobond begin to get fleshed out until a version emerges that is palatable to German sensitivities. For the next few months, then, the crisis is contained. Is this the end of the euro crisis? Alas, no. We suspect that there will be continued volatility and headline risk. Progress will be uneven, and there will surely be setbacks. In particular, we think the ultimate status of Greece in the euro zone remains an open issue. Once Spain has formally applied for relief from the ESM, eyes will turn to Italy to see what they will do. And, of course, what brought the crisis to light was the vast accumulation of public debt, which must be addressed. An outcome that makes the debt of sovereign nations a mutual obligation will make it more manageable, but it will not make it go away. As we have outlined in other papers, the total debt for the region has the potential to be a drag on economic growth for many years. So, how does this affect investment decisions? To begin with, it’s worth reminding ourselves that equities still offer investors the best opportunity for long-term gains. Despite the euro zone’s travails and its sputtering economy, global economic growth is still expected to be positive. The World Bank expects real GDP to grow by 2.5% this year and 3% next year. That should lead to earnings growth. Over long periods, nominal GDP growth and earnings growth are correlated. Corporate earnings ultimately capture productivity and inflation, giving equities an advantage over other asset classes. But in volatile times, sound portfolio construction and continuous risk management are critical to preserve capital and achieve investment goals. Since the crisis began we have regularly examined the portfolios we manage and their exposure to euro zone economies. Our primary focus has been on the sources and uses of free cash flow. Companies with the ability to grow free cash flow tend to be less volatile. We favor companies with competitive advantages that can create a greater degree of certainty around free-cash-flow growth. But we also look for risks, such as economically sensitive business models, particularly at a time when the euro zone economy is contracting. We are also sensitive to risks specifically associated with the three scenarios we have outlined, including the potential breakup of the euro. These include capital flight, currency swings, further write-downs of sovereign debt and new taxes on certain industries to bolster government coffers. In a limited number of instances, we have already exited some positions in light of these threats. How free cash flow is used is just as important. We expect the companies we invest in to make decisions in a disciplined way, based on their cost of capital. If reinvesting in the business or making an acquisition makes sense on that basis, then we would view that as a legitimate use of free cash flow. If not, we expect a significant portion of free cash flow to be returned to investors in the form of dividends, share buybacks or debt reduction — what we refer to as shareholder yield. In the euro scenario we describe as being the most likely, the accompanying environment is one of slow growth and continued market volatility. Those factors, along with interest rates that have little room to decline further, make it unlikely for price-to-earnings ratios to meaningfully expand. That will make returning cash to shareholders a larger component of equity returns in the coming years. And companies with that mindset will continue to attract investors, especially those who have income requirements unfulfilled by current bond yields and those who take comfort in a steady stream of income as a buffer in a world of volatile stock prices.